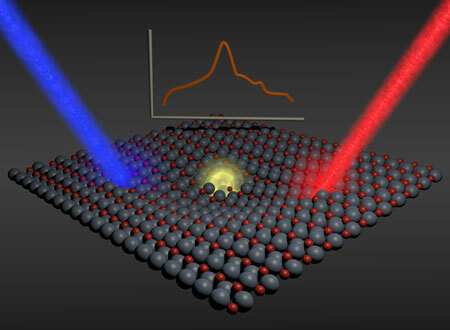 (Nanowerk News) Researchers of Karlsruhe Institute of Technology (KIT) have unveiled an important step in the conversion of light into storable energy: Together with scientists of the Fritz Haber Institute in Berlin and the Aalto University in Helsinki/Finland, they studied the formation of so-called polarons in zinc oxide. The pseudoparticles travel through the photoactive material until they are converted into electrical or chemical energy at an interface. Their findings that are of relevance to photovoltaics among others are now published in the renowned journal Nature Communications ("Evidence for photogenerated intermediate hole polarons in ZnO"; DOI 10.1038/ncomms7901).